There was enthusiastic discussion at the conference table but at the end oft he day the whole jury agreed on six comepletly different projects connecting creative scenes and tourism. Claudia Jericho (CREATIVE.NRW), Edwin Jacobs (Dortmunder U), Sabine Pracht (fvw), Ljiljana Radlovic (DC Open), Dr. Ulrich Soénius (IHK Köln) and Dr. Heike Döll-König (Tourismus NRW e.V.) choose six projects among 60 nominations to award them with the #urbanana-Award. Congratulations and we are looking forward to experience every single one. © Ralph Sondermann, Tourismus NRW e.V. During the discussion at the jury meeting, it became very clear that as much as Düsseldorf can be classified as a major fashion centre in terms of its turnover and self-image, its aura, which no doubt does exist, hardly radiates beyond the Rhineland area. One of the reasons that the #urbanana award jury has chosen to honour Marion Strehlow, with her “Behind the Scenes” project, is that she offers a long overdue examination of Düsseldorf as a fashion city beyond big business. The application submitted impresses with its great conceptual maturity, and the connection made between exuberant enthusiasm for real craftsmanship and functional potential analysis and planning. We look forward to a creative ego trip in the best sense of the word - and to a round tour that is sure to live up to what its title promises: please give a big fashion show-style round of applause to Marion Strehlow and Michael Dimitrov and theri project, “Behind the Scene”! It’s rare for a woman to be happy about a ladder in her tights, but in the case of the “Krefelder Perspektivwechsel”, all members of the jury, male and female, are particularly looking forward to a fashion festival planned under this name for next summer. The whole thing is clearly much more than just a collection of old stockings: the “Krefelder Perspektivwechsel” with its numerous project strands gives new meaning to the city, not only for and with its inhabitants, but also to surprise visitors from elsewhere who until now have not taken any real notice of Krefeld. Whether it’s high-quality “factory talks” or the city as a laboratory for building culture and digitalisation, or an unusual romantic Rhine atmosphere at the Rhine Side Gallery, with zig small things building rubble becomes a beach, construction containers become showrooms and wasteland marks a new beginning. In connection with the #urbanana award, a huge compliment from the jury goes to the inexhaustible wealth of ideas and depth of content of the Krefeld city marketing campaigns. A velvety smooth, glossy round of applause please for Ulrich Cloos and Claire Neidhardt and their team! If someone mentions being “deep in the West”, they usually either mean Bochum, or in this case the venerable imperial city of Aachen. The news that here, in the pan-European border region not far from Liège and Maastricht, quite a lot is also happening when it comes to NEW inspiring design, has even reached as far as Düsseldorf. The Hello Designer-Tour now finally offers the long-awaited reason to go and experience this on site. With a holistic concept of design, which ranges from communication design through to fashion and tattoo art, and with the wonderfully unpretentious attitude towards the whole project, offering it “to colleagues and normal people”, the project planners are promoting beautiful, good things throughout October and are creating a powerful impulse for cross-border cooperation. The crowning moment will come in 2018 in the form of the planned Peer-to-Peer Guide with cross-border portraits. With the motto of the project in mind - “Bad English is better than doing nothing” - we are also creating the hashtag #hellodesignertour. 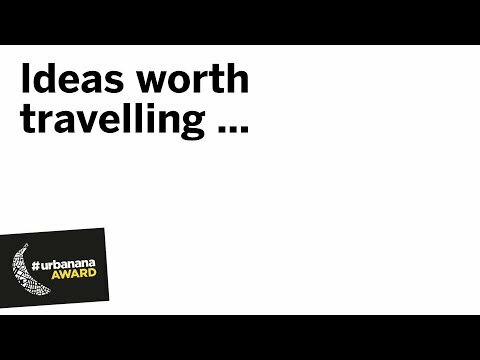 These are “Ideas worth travelling”! We ask you for a big international round of applause for Fabian Seibert, Chantal Rexhausen and Jan Kassel and their network from Belgium, Germany and the Netherlands. We will join you next year! This is a bit like a sustainable, neighbourhood-friendly AirBnB from below. The vision at ConcordiART is a guesthouse located away from the city centre, and in the middle of the Dortmunder Nordstadt area, consisting of artistically designed apartments with a central reception in the beautiful Wilhelminian-style Concordia-Haus building. Anyone who has visions should go and see a doctor - or travel to the Ruhr area, where they are serially made real at the Borsigplatz square in what has become an annual tradition. After the introduction of a local creative currency, after herds of sheep keeping the grass down in the urban space and above all, aside from individual events, after years of fostering and maintaining a “Multiverse” of problems and opportunities, an exchange between urbanists from outside the city and FC Bayern fans, as with dreamers and commercial travellers, is now planned in the Nordstadt area. The jury presents the ConcordiART project with the #urbanana award for its highly promising approach to translating the open, welcoming nature of this area of the city into an offer that is tailored to the needs of target groups. A south stand-size round of applause for the Kreativ.Quartiers Echt Nordstadt and for a perhaps more real-life Dortmund version of the Phoenix rising from the ashes! I work on trends that don’t yet have a name. This #urbanana idea had a very unflamboyant look: the unusual concept was described in a matter-of-fact way on just two pages, in 11pt Times New Roman font. How about linking together works of art in the sacred halls of the museums with their histories in the urban area, and in so doing, strip away part of the invisible walls between the temples of art and their profane surroundings? From the Wallraf-Richartz Museum, tours with the Musity app, which is currently being planned, follow in the footsteps of the Holy Ursula - and take you to a nightcap in the cosy King Georg bar or to the Cologne masters in the Medieval “rue de peintres” - as well as to the Peek & Cloppenburg clothing store. It is this unpretentious, but appreciative approach, combined with the (real) dissertation-like depth of knowledge about the trio of communication, city and art that persuaded the jury to give the project a chance of being realised by presenting the #urbanana award. A special exhibition opening-like round of applause please for Anna Döbbelin! 🤩 Four creatives connected to one Düsseldorf picture: Of course old master Beuys pictured by ORTICANOODLES. But then also photographer Raphael Janzer and the nameless women on the left.